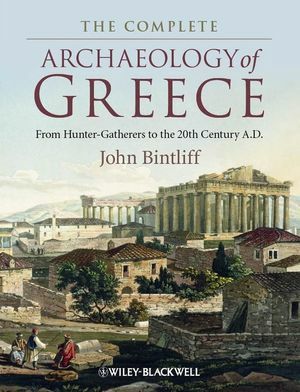 John Bintliff’s new tome (May 2012) looks like a serious comprehensive work. At 544 pages, The Complete Archaeology of Greece: From Hunter-Gatherers to the 20th Century A.D. promises to tell the story of Greek culture from the Paleolithic to the modern era. It doesn’t get much more comprehensive than this. Here’s the description from the Wiley-Blackwell website. The Complete Archaeology of Greece covers the incredible richness and variety of Greek culture and its central role in our understanding of European civilization, from the Palaeolithic era of 400,000 years ago to the early modern period. In a single volume, the field’s traditional focus on art and architecture has been combined with a rigorous overview of the latest archaeological evidence forming a truly comprehensive work on Greek civilization. And here is the table of contents. Judging from the index, the Corinthia makes a very good showing. There’s even some discussion of the Eastern Korinthia Survey.